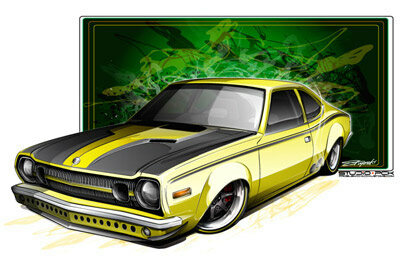 Pro-touring concept AMC Hornet project car rendering. Custom car and hot rod design by Studio PCK. A concept rendering depicting a customized AMC Hornet in full road-race mode. Illustrator artwork starting with loose pencil roughs to get placement of custom elements (bumper, hood treatment, wheels, etc).